Buy this item and earn 1,427 ClubPoints. AdderView DDX10 is a new breed of high performance KVM matrix that provides powerful functionality inside a small, compact form factor. Featuring Adder's trusted lossless KVM extension technology with flexi-port switching capability, DDX10 system enables multiple users to access multiple computers located safely and securely inside your server room. This adaptive system makes sharing numerous host computers among multiple users straightforward and flexible. Every computer is linked, via its USB and video ports, to a compact DDX-CAM module while each set of peripherals are connected to a DDX-USR module (to form consoles). The various computers and consoles are then linked, via standard CAT-7 cable, to a central DDX switch. Each user can then, subject to the privileges granted by the admin, gain quick access to any of the required computers. An integral part of DDX system is the DDX10 matrix switch, a browser-based configuration and management tool that allows one or more remote admin user(s) to monitor and maintain all aspects of operation. DDX10 switch uses a system of hierarchal access permissions to mediate between numerous consoles and multiple computers. Each console is granted the use of up to four types of access permissions to each computer, most of which influence how other users can gain simultaneous access to the same computer. Once computer access is permitted, administrators can select which levels of control will be available, allowing users to choose between four connection modes. The four access permissions, and their effects on other console users are: View only, Shared, Exclusive or Private connection modes. 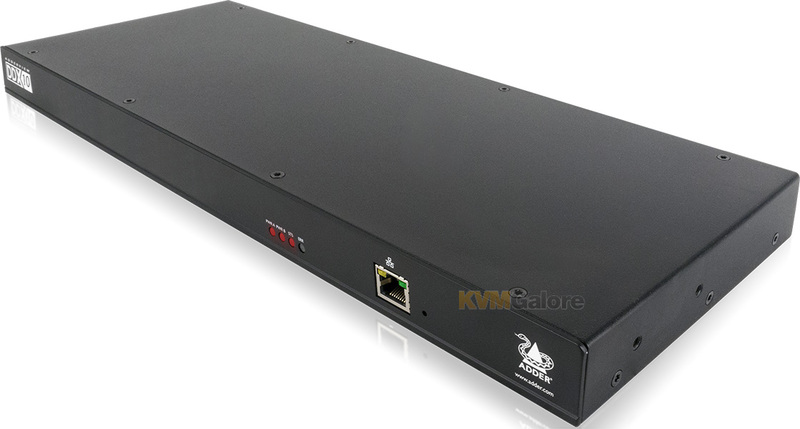 AdderView DDX10 is a flexible 10 port KVM matrix which can be re-configured to match your exact requirements. There are 10 flexi-ports that can be configured as computer inputs or user outputs. Once the ports are configured, simply connect your Computer Access Modules (CAMs) and user-stations (USRs). 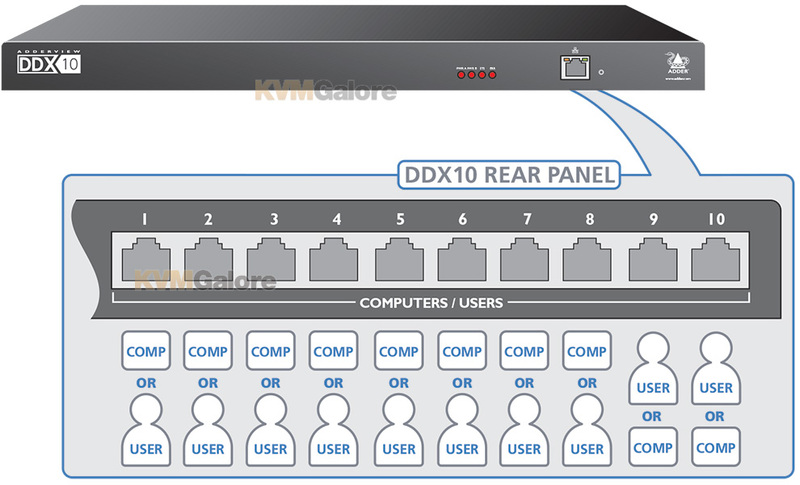 By default DDX10 switch provides 2 user console ports and 8 computer ports along its rear panel, however, these designations are not fixed. If your installation requires a greater number of computers or has a need for more user consoles, you can alter the allocation of these standard ports to suit. 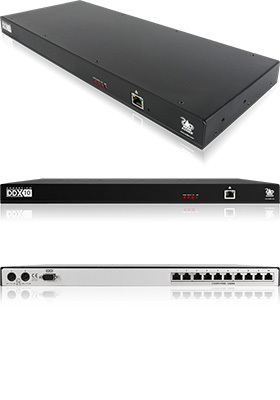 DDX10 features 'zero U' computer access modules (dongles) and a high density 1U KVM matrix switch, ideal for installation in heavily populated server racks for small and medium sized applications. DDX10 delivers lossless HD video at resolutions of up to 1920x1200 @ 60Hz providing a real-time, 'at the PC' experience. Frame rate matching makes this product ideal for applications using non standard refresh rates. DDX10 emulates a fully featured keyboard and mouse to all computers, maintaining fast switching speeds and instant USB interaction. DDX10 emulates a fully featured keyboard and mouse to all computers, maintaining fast switching speeds and instant USB interaction. The unique multi-view on-screen display (OSD) provides users with a live preview of permitted computers direct on their screen. Users can highlight their selection using a mouse cursor. Once highlighted, the user has the ability to choose from 4 different connection modes. DDX10 enables users to work safely and securely with a choice of connection modes. In Exclusive mode, users have full KVM control while being able to share video content with other colleagues. By connecting in Private mode, users can work in privacy. DDX10 transmitters (CAMs) and receivers (USRs) can be grouped to form 'Computers' and 'Consoles' that support dual-head and quad-head connectivity. For example, DDX10 can be used to build a 2 users x 3 computer dual-head matrix. Powered by USB, the digital Computer Access Modules sit in-line and are ideal for racks with limited available space. Modules are available in DVI, DisplayPort and VGA options. System administrators can securely access DDX10 management tools to configure system settings, set access privileges and control video connections. The interface is secured using HTTPS and administrators must login each time they connect. An API enables switch control from a 3rd party control system. Listed below are additional products to consider which are compatible with AdderView DDX10. These items may be required to complete your system.